Now I'm not usually one to gloat about my achievements, I am a simple OSRS player, I have no desire for infernal cape glory or 10k kc pet hunts. I have never screenshotted a pet, boss kc or a skill level. So now I would like to share my greatest achievement in 15 years of Runescape. 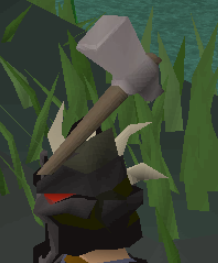 I managed to bring my Rock Hammer on my first trip to Gargoyles for two slayer tasks in a row. A first in over 4,500kc. Thank you all for sharing this moment with me.